Friday night Alyce saw her first play. Our neighbor Liz is a teacher at a local school and her students put on the play Aladdin. Liz thought Alyce would be interested in the performance and invited us to go. We weren't really worried that Alyce would sit through the performance. She can sit for two hours for a Disney movie without any problems. We were kind of afraid of how she would react to a dark theater between scenes. Mom did a very good job of explaining to Alyce what was going to happen and I think it sunk in. When the lights dimed before the actors came out Alyce just sat there as if nothing had changed. With about 5 minutes to go in the first act Alyce got a bit fidgety. Mom was prepared; she pulled from her purse a box of animal crackers and we made it to intermission. During intermission Liz showed us her classroom. School has changed quite a bit since I attended. Gone are the chalkboards and even the white boards with dry erase markers. Now the teachers have digital projectors where they can write on the board with electronic ink. Liz explained that this was brand new to her classroom and that she was going for training soon. I wonder what will change between now and when Alyce attends classes in three years. The second act flew by and the evening was a success. 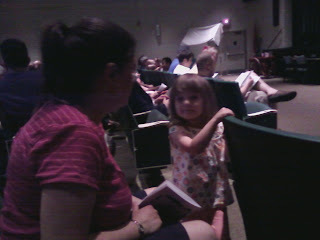 Alyce behaved herself and seemed to enjoy the musical even if she didn't really understand the storyline. At the very least she got some animal crackers. 0 comments on "Alyce's First Play"